Published on May 29, 2014 by Martyn. Be the first to comment! I’m very much looking forward to the launch event for the young-adult programme at the 2014 Big Bookend Festival in Leeds, where I’ll be talking about my work, giving a reading from Never Ending, answering questions from the audience and signing books. It promises to be a lively and fun-filled evening. Sharing a stage with me will be Helen Brandom, a debut YA novelist who also writes for stage and television and the YA novelist and scriptwriter June Taylor. There will also be live music from singer-songwriter duo, Lucy and Jo, and a preview of a drama production by the Escape Youth Theatre as part of the Leeds Story Cycle. The evening kick-starts this year’s BBE festival, now in its third year, and which includes three programmes of events – for children, young adults and adults. 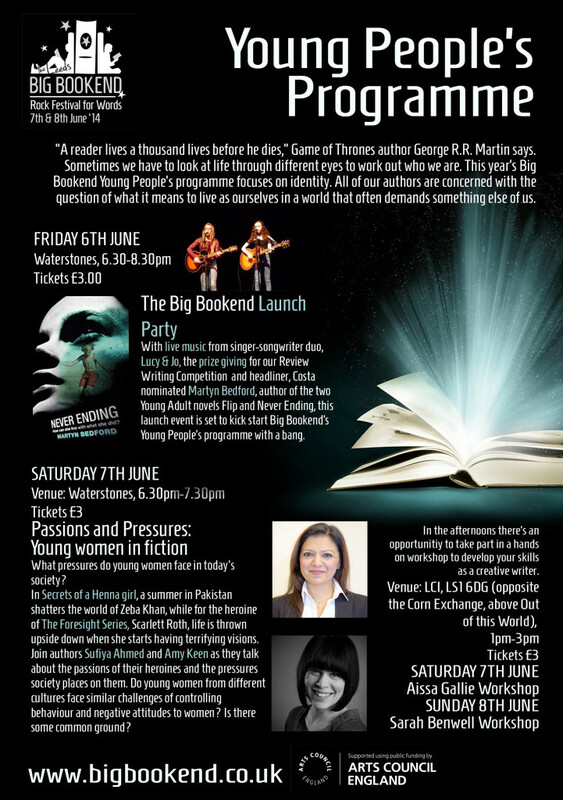 The YA launch event is at Waterstones bookshop, in Albion Street, Leeds, from 6.30 to 8.30pm on Friday June 6th. Tickets cost £3. Here’s a link to the BBE 2014 website for full details of the evening and how to buy tickets.